Senior club appearances and goals counted for the domestic league only and correct as of November 13, 2015. ਰੌਚੈਸਟਰ, ਨਿਊਯਾਰਕ ਵਿਚ ਪੈਦਾ ਹੋਇਆ, ਵਾਮਬਾਚ ਪਿਟਸਫੋਰਡ ਦੇ ਰੋਚੈਸਟਰ ਉਪਨਗਰ ਵਿਚੋਂ ਇੱਕ ਉੱਚ ਖਿਰਦੀ ਵਜੋਂ ਉਭਰੀ ਸੀ। ਪੀਟ ਅਤੇ ਜੂਡੀ ਵਮਬਾਚ ਤੋਂ ਪੈਦਾ ਹੋਈ ਉਹ ਸੱਤ ਭੈਣ-ਭਰਾ (ਦੋ ਭੈਣਾਂ ਅਤੇ ਚਾਰ ਭਰਾ) ਦੇ ਸਭ ਤੋਂ ਛੋਟੀ ਸੀ।ਚਾਰ ਸਾਲ ਦੀ ਉਮਰ ਵਿਚ ਉਸਨੇ ਫੁਟਬਾਲ ਖੇਡਣਾ ਸ਼ੁਰੂ ਕਰ ਦਿੱਤਾ। ਉਨ੍ਹਾਂ ਦੀ ਮਾਂ ਨੇ ਲਾਇਬਰੇਰੀ ਤੋਂ ਇੱਕ ਕਿਤਾਬ ਦੀ ਪੜਤਾਲ ਕੀਤੀ ਕਿ ਖੇਡ ਕਿਵੇਂ ਖੇਡੀ, ਅਤੇ ਉਦੋਂ ਤੋਂ ਫੁੱਟਬਾਲ ਉਨ੍ਹਾਂ ਦੇ ਪਰਿਵਾਰਕ ਪਰੰਪਰਾ ਦਾ ਹਿੱਸਾ ਬਣ ਗਿਆ। ਵਾਮਬਾਚ ਨੇ ਇਕ ਇੰਟਰਵਿਊ ਵਿਚ ਕਿਹਾ "ਮੇਰੇ ਖ਼ਿਆਲ ਵਿਚ ਮੈਂ ਜੋ ਕਰਨਾ ਚਾਹੁੰਦੀ ਹਾਂ, ਉਹ ਹੁਣ ਮੈਂ ਕਰਨਾ ਚਾਹੁੰਦੀ ਹਾਂ". "ਸਭ ਤੋਂ ਛੋਟੀ ਉਮਰ ਦੇ ਹੋਣ ਦੇ ਨਾਤੇ ਟੀਮ ਦੇ ਵਾਤਾਵਰਣ ਵਿਚ ਜੋ ਹੁੰਦਾ ਤੁਸੀਂ ਉਸ ਤੋਂ ਹਰ ਤਰ੍ਹਾਂ ਦੀਆਂ ਗੱਲਾਂ ਸਿੱਖਦੇ ਹੋ ... ਮੈਂ ਸਿੱਖਿਆ ਕਿ ਕਿਵੇਂ ਮੁਕਾਬਲਾ ਕਰਨਾ ਹੈ, ਮੇਰੇ ਭਰਾ ਅਤੇ ਭੈਣਾਂ ਹਮੇਸ਼ਾ ਮੇਰੇ ਨਾਲ ਉਸੇ ਪੱਧਰ ਉੱਤੇ ਖੇਡਦੇ ਹਨ ਅਤੇ ਉਹ ਮੈਨੂੰ ਕਦੇ ਵੀ ਜਿੱਤਣ ਨਹੀਂ ਦਿੰਦੇ ਮੈਂ ਉਹਨਾਂ ਨਾਲੋਂ ਬਿਹਤਰ ਸੀ ਅਤੇ ਇਸਦਾ ਹੱਕਦਾਰ ਸੀ। ਇੰਨੇ ਵੱਡੇ ਪਰਿਵਾਰ ਵਿੱਚ ਹੋਣ ਕਰਕੇ ਤੁਸੀਂ ਨਿਮਰ ਬਣ ਜਾਂਦੇ ਹੋ। ਤੁਹਾਡੇ ਕੋਲ ਕੋਈ ਵਿਸ਼ੇਸ਼ ਹੁਨਰ ਜਾਂ ਪ੍ਰਤਿਭਾ ਹੋ ਸਕਦੀ ਹੈ ਪਰ ਹਮੇਸ਼ਾ ਕਿਸੇ ਵਿਅਕਤੀ ਨੂੰ ਤੁਹਾਡੇ ਨਾਲੋਂ ਕੁਝ ਬਿਹਤਰ ਬਣਾਉਦੀ ਹੈ।"
↑ "Timeline: Abby Wambach's soccer career". Democrat & Chronicle. December 17, 2015. Retrieved April 4, 2016. ↑ Redden, Jim (April 3, 2016). "Soccer star Wambach arrested for DUII in Portland". Portland Tribune. Retrieved April 3, 2016. ↑ Steven Goff (May 10, 2015). "Abby Wambach scores twice as U.S. women defeat Ireland, 3–0". Washington Post. ↑ GatorZone.com, Soccer History, 2001 Roster, Abby Wambach. Retrieved May 3, 2011. ↑ "Abby Wambach: American soccer hero". ESPN. June 19, 2013. Archived from the original on 2012-07-01. Retrieved August 7, 2013. ↑ Rogers, Martin (July 15, 2011). "USA's Wambach was bred for this moment". Yahoo! Sports. Retrieved July 27, 2013. ↑ "Washington Freedom 2002 Stats". WUSA. Archived from the original on June 17, 2002. Retrieved August 7, 2013. ↑ "Washington Freedom 2003 stats". WUSA. Archived from the original on July 7, 2003. Retrieved August 7, 2013. ↑ "Abby Wambach". SoccerWay. Retrieved August 7, 2013. ↑ "FIFA Women's World Cup USA 2003: MATCH Report: USA – Sweden: Group matches". FIFA. ↑ "FIFA Women's World Cup USA 2003: MATCH Report: USA – Nigeria: Group matches". FIFA. ↑ "U.S. WNT Tops Nigeria, 5–0, in Second Match of Women's World Cup". U.S.Soccer. September 25, 2003. Archived from the original on 2012-04-25. ↑ "FIFA Women's World Cup USA 2003: MATCH Report: Korea DPR – USA: Group matches". FIFA. ↑ "FIFA Women's World Cup USA 2003: MATCH Report: USA – Norway: Quarter-finals". FIFA. ↑ "U.S. Advances To Semifinals with 1–0 Win Over Rival Norway". U.S.Soccer. October 1, 2003. Archived from the original on 2012-07-14. ↑ "FIFA Women's World Cup USA 2003: MATCH Report: USA – Germany: Semi-finals". FIFA. ↑ "FIFA Women's World Cup USA 2003: MATCH Report: USA – Canada: Match for third place". FIFA. ↑ "Olympic Football Tournaments Athens 2004 – Women: MATCH Report: Greece – USA: First stage". FIFA. ↑ "U.S. Olympic Women's Soccer Team Downs Greece 3–0 in Opening Match of Olympics". U.S.Soccer. August 11, 2004. Archived from the original on 2012-07-14. ↑ "Olympic Football Tournaments Athens 2004 – Women: MATCH Report: USA – Brazil: First stage". FIFA. ↑ "U.S. Women Defeat Brazil 2–0 in Olympics Behind Hamm & Wambach Goals". U.S.Soccer. August 14, 2004. Archived from the original on 2012-04-25. ↑ "Olympic Football Tournaments Athens 2004 – Women: MATCH Report: USA – Japan: Quarter-finals". FIFA. ↑ "U.S. WNT Advances to Olympic Semifinals With 2–1 Victory Over Japan, Will Face Germany on Monday". U.S.Soccer. Archived from the original on 2012-04-25. ↑ "Olympic Football Tournaments Athens 2004 – Women: MATCH Report: USA – Germany: Semi-finals". FIFA. ↑ "Olympic Football Tournaments Athens 2004 – Women: MATCH Report: USA – Brazil: Gold medal match". FIFA. ↑ "U.S. Wins Gold Medal on Wambach Overtime Strike". U.S.Soccer. August 16, 2004. Archived from the original on 2012-04-25. ↑ "FIFA Women's World Cup – China 2007: MATCH Report: USA – Korea DPR: First stage". FIFA. ↑ "Wambach and O'Reilly Score as U.S. Women Tie North Korea, 2–2, to Open 2007 FIFA Women's World Cup". U.S. Soccer. September 11, 2007. Archived from the original on 2012-04-25. ↑ "FIFA Women's World Cup – China 2007: MATCH Report: Sweden – USA: First stage". FIFA. ↑ "Wambach Scores Both Goals as U.S. WNT Rolls Past Sweden in Crucial Group B Match". U.S.Soccer. September 14, 2007. Archived from the original on 2012-04-25. ↑ "FIFA Women's World Cup – China 2007: MATCH Report: Nigeria – USA: First stage". FIFA. ↑ "FIFA Women's World Cup – China 2007: MATCH Report: USA – England: Quarter-finals". FIFA. ↑ "U.S. Women Score Three Times in 13 Minutes During Second Half to Blow Open Quarterfinal and Defeat England, 3–0, to Advance to Semifinal of 2007 FIFA Women's World Cup". U.S. Soccer. September 22, 2007. Archived from the original on 2012-04-25. ↑ "FIFA Women's World Cup – China 2007: MATCH Report: USA – Brazil: Semi-finals". FIFA. ↑ "FIFA Women's World Cup – China 2007: MATCH Report: Norway – USA: Match for third place". FIFA. ↑ "U.S. Women Defeat Norway, 4–1, to Take Third Place". U.S.Soccer. September 30, 2007. Archived from the original on 2012-04-26. ↑ "FIFA Women's World Cup – Germany 2011: MATCH Report: Korea DPR – USA: First stage". FIFA. ↑ "FIFA Women's World Cup – Germany 2011: MATCH Report: USA – Colombia: First stage". FIFA. ↑ "FIFA Women's World Cup – Germany 2011: MATCH Report: Sweden – USA: First stage". FIFA. ↑ "U.S. Falls 2–1 to Sweden to Finish in Second Place in Group C at 2011 FIFA Women's World Cup". U.S. Soccer. July 6, 2011. Archived from the original on 2012-04-24. ↑ "FIFA Women's World Cup – Germany 2011: MATCH Report: Brazil – USA: Quarterfinals". FIFA. ↑ "Solo Save Gives USA 5–3 Win Against Brazil in Penalty Shootout to Advance to Face France in FIFA Women's World Cup Semifinal". U.S.Soccer. July 10, 2011. Archived from the original on 2012-07-06. ↑ "FIFA Women's World Cup – Germany 2011: MATCH Report: France – USA: Semi-finals". FIFA. ↑ "U.S. WNT Advances to Final of 2011 FIFA Women's World Cup". U.S.Soccer. July 13, 2011. Archived from the original on 2012-04-24. ↑ "FIFA Women's World Cup – Germany 2011: MATCH Report: France – USA: Final". FIFA. ↑ "USA Falls in Dramatic Penalty Kick Shootout to Japan in 2011 FIFA Women's World Cup Final". U.S. Soccer. July 17, 2011. Archived from the original on 2012-04-24. ↑ "Women's Olympic Football Tournament London 2012: MATCH Report: USA – France: First stage". FIFA. ↑ "U.S. Women's National Team Defeats France 4–2 to Open Group G Play at 2012 Olympics". U.S. Soccer. July 25, 2012. Archived from the original on 2012-08-16. ↑ "Women's Olympic Football Tournament London 2012: MATCH Report: USA – Colombia: First stage". FIFA. ↑ "U.S. Women's National Team Clinches Quarterfinal Berth with 3–0 Victory Against Colombia in Group G". U.S.Soccer. July 28, 2012. Archived from the original on 2012-08-01. ↑ "Women's Olympic Football Tournament London 2012: MATCH Report: USA – Korea DPR: First stage". FIFA. 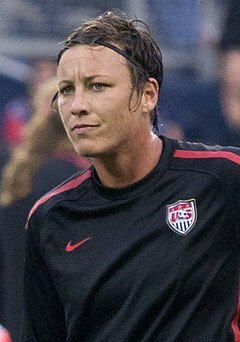 ↑ "Abby Wambach Goal Gives U.S. Women's National Team a 1–0 Victory Against Korea DPR and Group G Title at 2012 Olympics". U.S. Soccer. July 31, 2012. Archived from the original on 2012-08-01. ↑ "Women's Olympic Football Tournament London 2012: MATCH Report: USA – New Zealand: Quarter-finals". FIFA. ↑ "U.S. Women's National Team Downs New Zealand 2–0 to Advance to Olympic Semifinal in Manchester". U.S. Soccer. August 3, 2012. Archived from the original on 2012-08-06. ↑ "Women's Olympic Football Tournament London 2012: MATCH Report: USA – Canada: Semi-finals". FIFA. ↑ "Women's Olympic Football Tournament London 2012: MATCH Report: USA – Japan: Final". FIFA. ↑ "FIFA Women's World Cup Canada 2015: MATCH Report: USA – Australia: First stage". FIFA. ↑ "FIFA Women's World Cup Canada 2015: MATCH Report: USA – Sweden: First stage". FIFA. ↑ "FIFA Women's World Cup Canada 2015: MATCH Report: USA – Nigeria: First stage". FIFA. ↑ "USA Through to Round of 16 After 1–0 Win against Nigeria". U.S.Soccer. ↑ "FIFA Women's World Cup Canada 2015: MATCH Report: USA – Colombia: Round of 16". FIFA. ↑ "FIFA Women's World Cup Canada 2015: MATCH Report: China PR – USA: Quarter-finals". FIFA. ↑ "FIFA Women's World Cup Canada 2015: MATCH Report: USA – Germany: Semi-finals". FIFA.